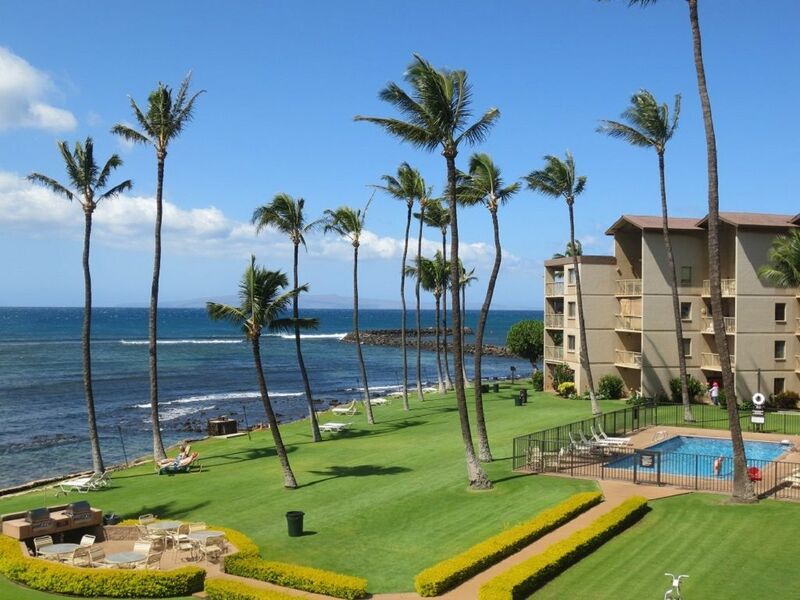 Enjoy the beautiful seascapes, surrounding islands and lovely Hawaiian skies above meticulous, palm-lined grounds. Winter whale season from approx end of Nov to mid Apr. Catch the occasional view of resident turtles from the lanai. The peace within may entice you to re-think your plans to leave!! This unit has all the amenities suited to facilitate a very comfortable and enjoyable Maui holiday on the Valley Isle. Gentle tradewinds, nature's "Air Conditioning", brings in cool air from the West Maui mountains. Maalaea Small Boat Harbor and Shops are a short walk from the unit . Explore the stores and shops at the harbor, enjoy a charter boat trip, and maybe dine at one of the area restaurants. Aside from the harbor, shops and restaurants, you will find a water park with miniature golf, water bumper boats, and a rock-climbing wall within walking distance. The Maui Ocean Center (Hawaii's only saltwater aquarium) is located at Maalaea Small Boat Harbor. A delightful way to spend the morning or afternoon with friends and family learning about Hawaii’s marine life. For those quiet times, take a long walk down a sandy beach that stretches for miles. Your Maui holiday awaits you!! This is an awesome condo and a great price. The view is amazing and the condo was stocked with everything you can imagine. We watched turtles play right at our feet and enjoyed the sun rise every morning behind the volcano. We will definitely be back. I am so happy to hear that you had a wonderful stay! We look forward to you staying with us again.. We greatly appreciate your review as well. We had a great time in the Maalaea Kai condo ,located on oceanfront with the views to dream for.Well stocked and clean. I am so happy to hear that you had a wonderful stay and found it had a great location! We constantly work towards guest satisfaction . We greatly appreciate your review as well. all was great we left the condo extremely clean wash all towels and all bed sheets the place was spotless .but we were charged condo cleaning fee.????? Outstanding condo, awesome view from the lanai, quiet, good parking, nice pool, great amenities in the room. I really enjoyed the camera tripod to borrow and take pictures and sunset pictures. Beach chairs could use an upgrade. Property manager was awesome and provided quick response getting us a couple of much needed box fans. Made a world of distance. Great fun looking for and seeing literally hundreds of turtles on the beach wall out in front. Friendly and helpful condo maintenance personnel. Excellent and well organized recycling area, reduced garbage a lot. Good to see. I am so happy to hear that you had a awesome and wonderful stay! We greatly appreciate your review as well. The condo is nicely located with a fantastic view onto the ocean. In the afternoon you can see sea turtles from your lanai. The location is good, as you can easily get to all other locations on the island with a rental car.